Walk the Razor's Edge: Time for a New Helmet! After reading Stacy's Full Face Helmet post and seeing the pictures there, a full face helmet was tops on my list of things to get. Personally, I am a "Helmet anytime on the bike," sort of fellow. 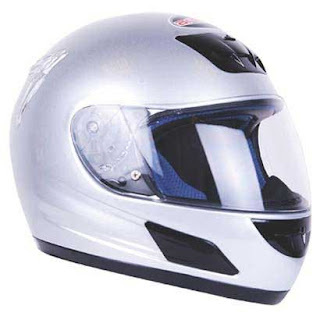 People who want to ride without a helmet ought to look at Stacy's blog post, linked above. But, hey, if you are reading this and are a dyed in the wool, 'wind in the face', 'I don't need a helmet' sort of rider, that's cool with me. So, Saturday morning I rode over to my local Cycle Gear and exchanged my $75 for an Arashi Turbo helmet and a reflective shield. Now, I don't know how I managed without a full face helmet. It is lighter than my Scorpion Exo200, more aerodynamic and minimizes the updraft of air into my nose. There is less wind noise and the shield fits the helmet quite securly. There is only one drawback noticed so far; the visibility as compared to the Scorpion is somewhat less in the vertical plane. The Arashi Turbo isn't fancy like an Arai or Shoei, with their advanced composite carbon fiber construction, removable inserts, high-tech ventilation systems and so forth. It is inexpensive, works well and is DOT approved. Been thinking about a full face helmet? This may be a very inexpensive way to save you jaw or front teeth should you be in a scrape. Sounds like you lucked out and got a good deal on a nice helmet. I love it when that happens! Nice buy. Thanks for the review. Several people I have told are going to look into them. After two weeks of riding with this helmet, I can't say enough good things about it. Only down side is that when stopped at a light I must crack the visor to let in enough air. But, it is more than a fair trade-off.